So day 8 is here, and it’s eyeliner day! I really feel like I should have added a waterproof number into this post as I have just finished watching last nights Grey’s Anatomy and lets just say there were a lot of tears!! I have picked 3 different kinds of eyeliner to talk about today and one particular one I love so much, I’ve included three different colours of it! Up top in this picture is the Smashbox Always Sharp 3D Liner in Billionaire which is a lovely khaki shade with a slight gold pearl effect. The colour looks lovely on the eyes and is a nice alternative to brown when you are feeling like a more neutral day. The eyeliner is really easy to use as it is always sharp and it has a nice creamy texture to it! It retails for £16.00 which I think is pretty reasonable to be honest as it last all day but is easy to take off at the end of the night! The only thing I wonder, is how much product do you lose as everytime you put the lid on it is automatically sharpened? It’s a good one to have all the same, and I would quite like to try another couple of shades of this particularly the navy blue! The next two eyeliners down and the one at the bottom of the picture are the Maybelline Master Drama Eyeliners, I have the colours Dark Brown, Grey and Dark Purple. These are really creamy, very very long lasting and pretty cheap too at only £4.49 a piece. They are also on 3 for 2 so I ended up with one for free. Bargain! The colour pay off is lovely, they sharpen really well and they don’t drag the eye when you are applying them. These are definitely some of the best eyeliners I have found to date! It would not be an eyeliner post without including a liquid eyeliner! I have only ever been able to use the ones that are in pen form as my hand goes a bit shaky when trying to apply the ones with a brush! 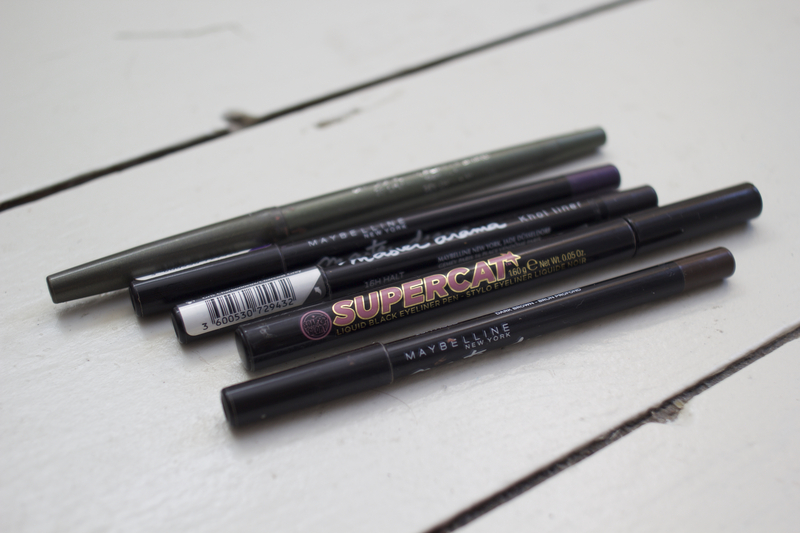 This is the Soap & Glory Supercat Eyeliner Pen and it is probably the best one I have tried. The nib isn’t too scratchy, it doesn’t dry out, it’s easy to use and it is really cheap! It retails for only £6.00 which I feel is such good value for such a brilliant product! They also do a ‘fat’ version if you like thicker eyeliner. This is my second or third one of these and I will continue to keep going back to this as I love it so much! What are your favourite eyeliners? Have you tried any brighter colours? Leave me any recommendations below! Great picks. I love the Stila stay all day liquid eyeliner. Totally budge proof!